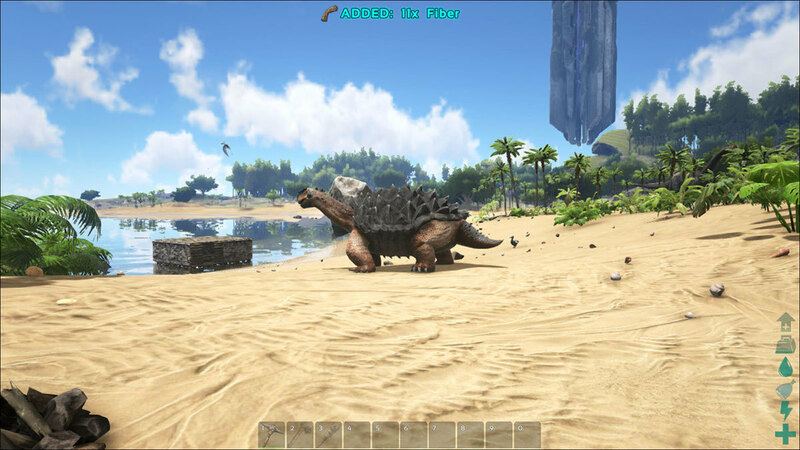 How to stay alive long enough to enjoy the beautiful scenery in Ark: Survival Evolved. Ark: Survival Evolved is an unforgiving game where everything and everyone is out to get you. Whether it be the local wildlife of carnivorous dinosaurs, scorpions, and sharks; the other players; or by heat, hypothermia, starvation, dehydration, or drowning - there are a lot of ways to kick the bucket. To survive you'll need a combination of wits, supplies, and equipment if you're going to survive even a single day on the island. For new players dying at least once is inevitable, but to help cut down on repeat occurrences here are some beginner tips to surviving the world of Ark: Survival Evolved. Having the right tool is essential if you want to collect resources quickly and without having to sacrifice your fists in the process. Each tool has a specific function that it excels at; axes are good at chopping wood, pickaxes for collecting stone, flint and metal from rock deposits, torches give light and a small amount of heat, spears are perfect for attacking the lower ranked creatures. Tools can also be made out of different materials, and become stronger as you level. Eventually you will unlock blueprints to create metal tools which take a fair bit of materials to craft, but have increased durability and can collect things a stone pickaxe can't such as crystals. Crafting tools is as easy as going to your crafting menu "V", selecting the blueprint and crafting. If the tool breaks while you're using it you can quickly craft another by selecting whatever number the tool is assigned to in your action bar. You've got to manage your weight wisely, especially during the early game. If you go over your weight limit you will become encumbered, meaning you'll move much slower and your stamina will deplete at a much faster rate. You can apply your common sense to weight management in Ark, heavier things like stones and metal will weight you down faster than berries or hide. When you eventually tame a dinosaur you can use it as a mobile storage unit, the bigger the dinosaur the more it can hold. Craftable storage chests can also be made, but be sure they are secured in your house with a locked door to prevent theft. Water is an essential but dangerous resource in Ark. It's essential because you need it just as much as you need food, but dangerous because a short swim can wear down your stamina in no time at which point you will drown. If you do need to swim make sure your stamina is full before diving in. Oh ya, don't forget the deadly Megalodon sharks lurking in the deep ready to take you down. Eventually you will get dehydrated and will have to venture in for a dip to grab a drink. So long as your head is under water your hydration meter will fill. Before you can venture inland use some of your leveling points to unlock the water skin craftable. When you have a water skin equipped, you can assign it to your action bar for water on the go. When it runs dry, swing by a source of water and jump in to refill it. You can hold multiple skins for increased water storage. If you're tired of starting in a random location every time you die you might want to get some sleep. Sleeping bags can be crafted and provide a onetime use respawn point for when you die. Eventually when you level up enough you can unlock the craftable bed which will give you a permanent respawn point (unless it's destroyed of course). Depending on your playstyle, running across other players could mean many different things for you. If you're a solo player looking for a tribe use the "B" button to politely ask around if they're accepting new members. If you're a solo player wanting to stay that way, it's probably best to avoid other players or at least explain your situation to them. For the most part people are a little more forgiving to new players than other survival games such as DayZ, but of course there are exceptions. The golden rule should be to approach any player with caution, probably more so than the dinosaurs.